Our picks for the best seasonal recipes featured in New Mexico Magazine. Into small bowl, using medium blade of food grinder, grind apricots. 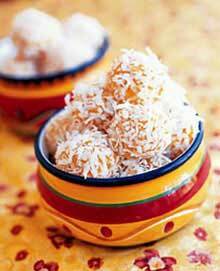 With hands, mix with coconut, powdered sugar and orange juice. Shape mixture into 1/2-inch balls; roll in sugar, if you like. Store in tight covered glass or plastic container. Fine for an appetizer or a meal. In soup pot, heat oil over medium-high heat. Add onion and cook for 2–3 minutes, stirring occasionally. and add remaining ingredients. Simmer for 10 minutes. Allow liquid to cool slightly, then purée in blender. (Caution: When blending, set blender on low speed and cover top with lid, towel, and a firm hand.) Adjust seasoning and consistency with salt and water. Serve in demitasses (espresso cups) and garnish with one or more of the following: sour cream, grated cheese, sliced jalapeños, sliced black olives, salsa, crispy tortilla strips, or diced avocado. 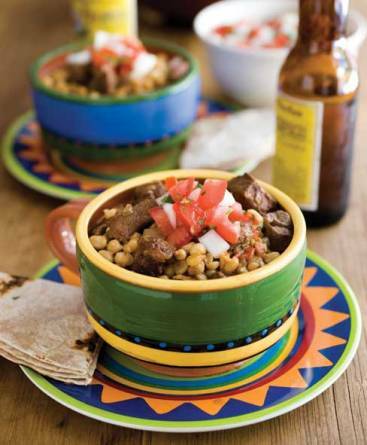 Different varieties of squash are abun­dant in New Mexico. Many of these varieties were developed by Native Amer­ican tribes. Choose your favorite squash to use in this soup. 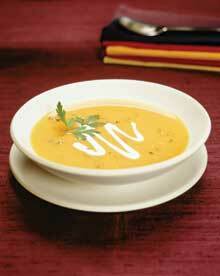 This is a lighter version of a squash soup, which works better as an appetizer for a big meal. The servings should be small. 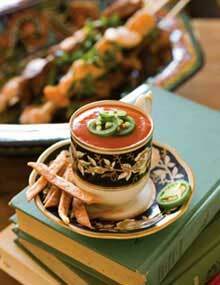 This soup can be made the day before and re­heated before serving. In a large saucepan over high heat add the olive oil and let heat until very hot. Add the shallots, garlic and ginger and sauté for about 2 or 3 minutes. Add the mirin and cook until half the liquid has evaporated, about 3 or 4 minutes. Add the diced squash and stock. Re­duce the heat and simmer until the squash is tender, about 15 minutes. Add the coconut milk and continue simmer­ing for 5 more minutes. While the soup is simmering, place the curry powder in a small sauté pan over high heat for about 1 or 2 minutes. Add it to the soup when it has finished simmering. Carefully puree the soup in a blender. Do this in smaller batches. Add the chile powder and season to taste with salt and pepper. Drizzle the crème fraîche onto the soup. Top with roasted seeds if desired. Preheat the oven to 350 degrees. Lightly grease a casserole dish. In a large bowl, mash the yams with 1 cup of the reserved liquid. It may be necessary to add a little more to get a good, smooth consistency. Add the eggs, sug­ar, vanilla and salt. Mix well and pour into the casserole dish. Sprinkle the pecans over the mixture and lightly sprinkle the red pepper flakes. Bake for 30 to 35 minutes.